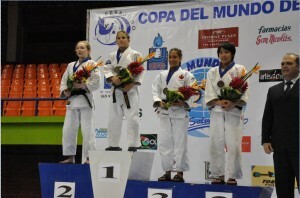 EBJI » Shiraishi Wins Bronze in El Salvador! You are Here:EBJI >> News >> Shiraishi Wins Bronze in El Salvador! Shiraishi Wins Bronze in El Salvador! Comments Off on Shiraishi Wins Bronze in El Salvador! Annie Shiraishi represented East Bay Judo Institute in the women’s 48 kilogram category at the first annual El Salvador World Cup this past weekend in San Salvador. In her first match, Shiraishi fought Bianca Ockedahl of Canada, whom she has met on many previous occasions. Most recently, Shiraishi had fought Ockedahl at the Venezuela World Cup the previous weekend, where she lost by a yuko (minor point) score. This weekend, Shiraishi came out aggressive, looking to take control of the match. Around a minute into the match, she threw Ockedahl for a wazari (half point) with a left o-guruma (hip throw). Shiraishi continued to control the match and threw Ockedahl for a yuko (minor point) with drop-seoinage with a minute left in the match. The win put her in the semi-finals against Paula Paretto, 2008 Olympic Bronze Medalist. In the semi-finals against Paretto the match was even with no score on either side until Shiraishi got thrown for yuko with a drop sode tsuri komi goshi in the last minute and half of the match. Shiraishi was then forced to chase Paretto for the win and was thrown for 2 more scores and was able to make up the deficit. She dropped down to the repecharge where she fought for bronze. In her bronze medal match, Shiraishi competed against Evelin Rodriguez of Guatemala. Shiraishi pinned Rogriguez for the win and her first world cup medal. This moves her up to the 57th place on the World Ranking List and also gives her an “A” level classification. Shiraishi now turns her attention to various training camps in the upcoming 2 months to prepare her for the World Cup in Miami as well as the World Championships to be held in Tokyo, Japan in September.